Located in a quiet place of Trsteno, just 17 km from Dubrovnik, this villa offers three bedrooms, a swimming pool, terrace, outdoor BBQ and sea views. 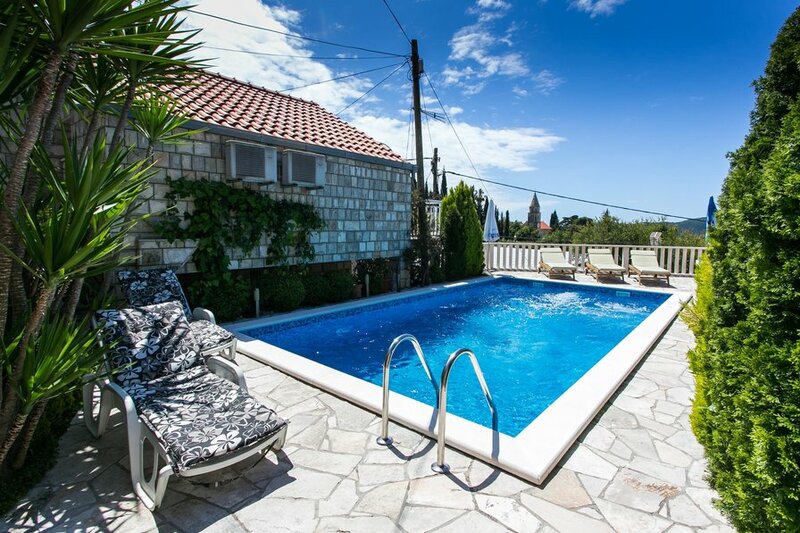 Located in a quiet little place of Trsteno, surrounded by nature and beautiful Adriatic Sea, just 17 km from Dubrovnik, Villa Mia offers three bedrooms, a swimming pool on a terrace with an outdoor shower, an outdoor BBQ and sea views. Villa was recently refurbished, in 2010, it is a brick/stone house for 8 people max and a child under 4 years comes for free. One pet is also allowed on the premises, and the villa also has two private bathrooms with a bathtub or a shower booth. Kitchen is fully equipped with a microwave, coffee maker, refrigerator, gas/electric cooker, freezer, washing machine, dishwasher and a vacuum cleaner if needed. Free parking is available on the premises. Terrace is 27 m2 and it comes with an outdoor shower, swimming pool, 4 sun loungers, outdoor barbecue facilities for all your cooking adventures with fresh local ingredients. This location is perfect for all guests who love to enjoy the sun and the sea, sea views, since it is close to the tourist center, but still far enough to avoid the crowds and keep your peace and privacy. Property is around 400 meters away from the famous Trsteno Arboretum which you should definitely visit.